Chef Geo of ProTreats gets us ready for the Big Game with his nutritious and absolutely delicious snacks, appetizers, and his twist on a classic margarita! GO BIG OR GO HOME! 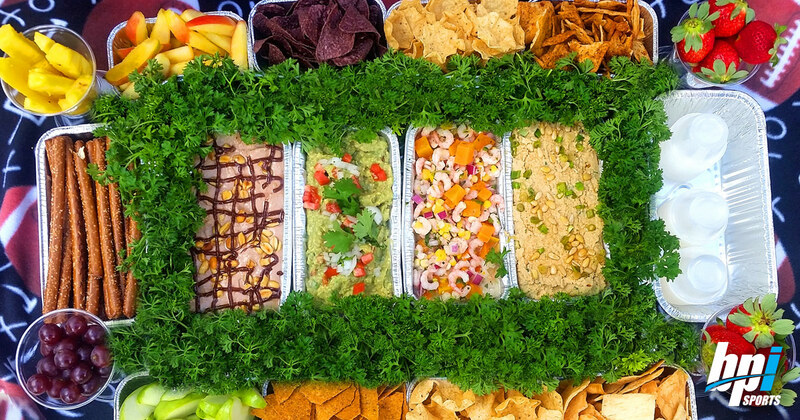 Score some major points at your BIG GAME PARTY with this stadium-size multi-flavored and delicious 100-Yard Dip Spread. This healthy spread has four quarters of goodness to choose from or you can enjoy them all! Made with BPI’s ISO HD™ and delicious hazelnut spread, served with red and green apples. We’re going green with some Fresh-Mex! This ultra-clean dip will have everyone gathering up for a huddle. Made with fresh Hass avocados and lime juice. This protein-packed lemon and lime cooked shrimp ceviche has a nice kick with a bit of sweetness. Made with organic garbanzo beans and tahini, this authentic and favorite dip is high in fiber and big on taste. 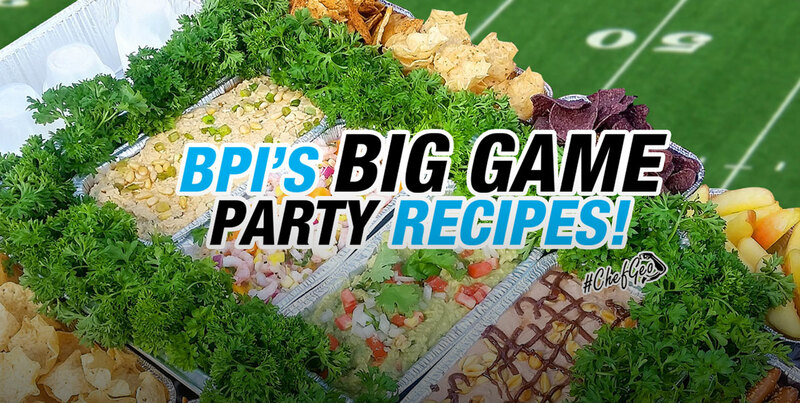 Score some major points at your Big Game party with this spicy and refreshing twist on an all-time classic drink using BPI Sports Best Glutamine™ (alcohol is optional). 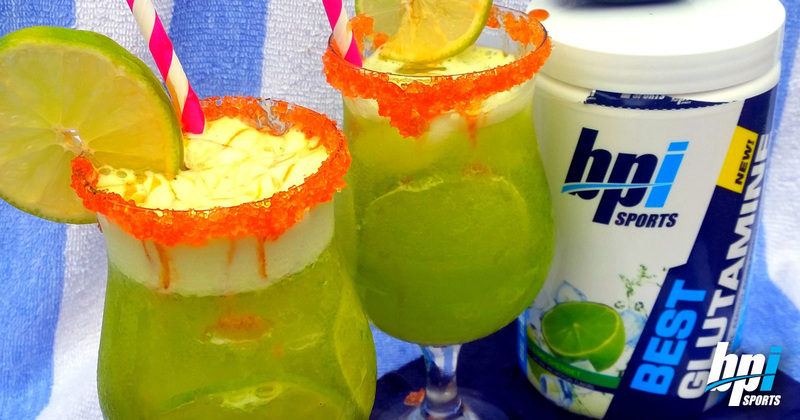 It’s much better to have a beverage with something healthy in it as opposed to those high fructose corn syrup additives contained in most traditional margaritas mixes. This margarita will help you minimize muscle breakdown and improve protein metabolism for recovery, immune system health and glycogen replenishment (vital for restoring energy levels especially after a long day of Football fun!). Rim the glass with coconut nectar and dip it in the salt and sugar mix. Place 4 lime slices at the bottom of the glass and add ice. In a bullet blender, mix the first 5 ingredients. Pour into Glass. As the foam begins to rise, drizzle some more coconut nectar over it. Enjoy! Are you ready for THE BIG GAME? 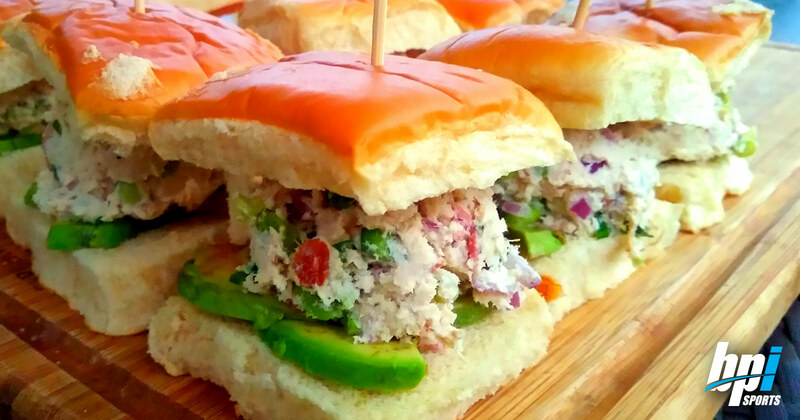 Score big with these healthy and delicious sliders. With 22 grams of protein per serving, 21 grams of carbs ,6 grams of fat and only 3 grams of sugar, you can’t go wrong! These sliders will satisfy even the hungriest of football fans. Season the chicken breasts with N’orleans Cajun seasoning. Heat sauce pan to high heat, once hot add the coconut oil. Cook the chicken breast for 1 minute on each side, leaving the inside raw. In a crock pot, add the chicken broth and the chicken breasts, then cook on high for a minimum of 5 hrs, or until the chicken shreds easily. Transfer the chicken to a cutting board and pull it apart. In a bowl, add the chicken, edamame, green onions, culantro, red onions, almonds, Greek yogurt and turkey bacon. Mix together using a large spoon until well blended. Separate the slider buns, then place 2 strips of avocados on each. Using an ice cream scoop, add one scoop of the mix, then top it with the other bun. Add a skewer through the middle to keep it stable. Repeat the process for the rest of the sliders. Enjoy! Can’t forget about dessert! 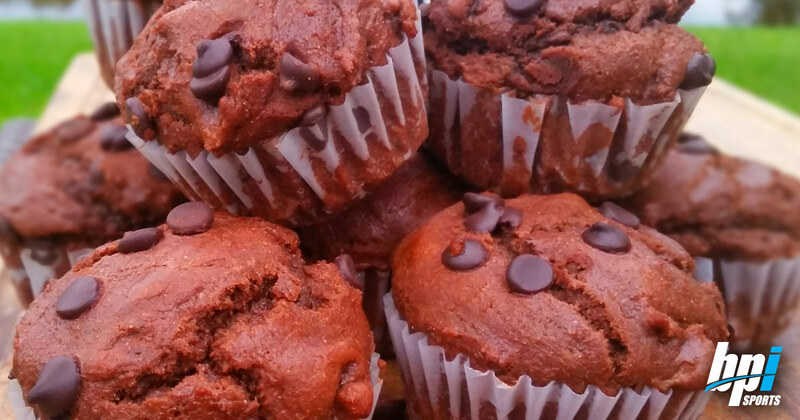 This scrumptious, moist, tasty and full-of-chocolate muffins not only have a great nutritional profile, but these protein muffins are so good! Even better the next day, in fact! Combine flour, protein powder, stevia, 3/4 cup chocolate chips, cocoa powder, and baking soda in a large bowl. Whisk egg, yogurt, milk, vanilla extract, and coconut oil in another bowl until smooth; pour into chocolate mixture and stir until batter is just blended. Bake on the middle rack, in a preheated oven, until a toothpick inserted into the center comes out clean, about 17 minutes. Cool in the pans for 10 minutes before removing to cool completely on a wire rack. Does the word “insanely delicious” come to mind? Because that’s exactly what these protein packed pancakes are. With 135 calories and 9 grams of protein, start your Big Game Day strong with the perfect protein pancake recipe. In a mixer or using a wooden spoon (don’t use a blender), mix the first three ingredients. If the mixture is too dry, add more water. Too wet add? Add more pancake mix. Then, heat a medium sized frying pan to medium heat. For an average sized pancake, use a 1/4 cup measuring cup, scoop some pancake mix and pour in the center. Do not move the scoop as your pour, so the mixture distributes out evenly forming a natural round pancake. Swirl a line of caramel syrup on top of the pancake and cook pancake until you see bubbles, then flip and cook for 1 minute. 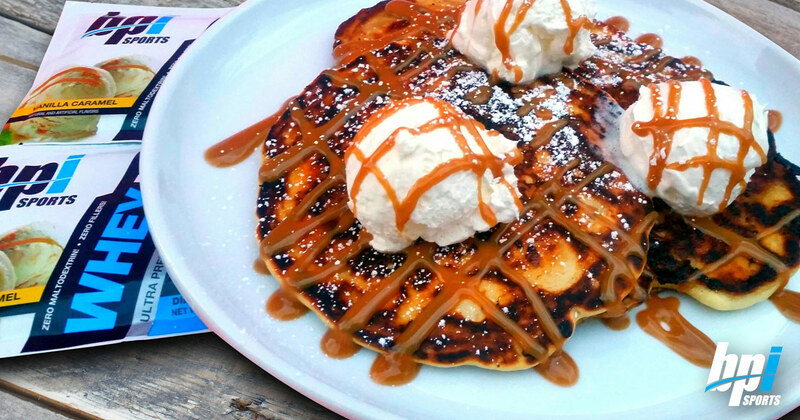 Using an ice cream scoop, scoop a ball of cool whip on top of the pancake and drizzle some more caramel and pancake syrup.